Posted by Dave Emory ⋅ April 8, 2012Post a comment Email This Post Print This Post Tweet This! To see a GOP presidential candidate cozying up with Nazis and white supremacists shouldn’t come as a surprise, given the fact that the party’s ethnic outreach organization little more than an extension of the Third Reich. The Reagan GOP was staffed by personnel selected by Helene von Damm, a protege of Otto von Bolschwing, Eichmann’s superior in administering the Third Reich’s extermination of the Jews. Ron Paul’s success with young and ignorant voters. Using his opposition to wars in Iraq and Afghanistan, desire to cut off U.S. foreign aid to Israel (which resonates with the Berkeley/Pacifica Radio constituency), support for “states rights” marijuana initiatives and adherence to the 9/11 Truther ideology, Paul has successfully played the role of pied piper to the young and innocent. His recent success at U.C. Berkeley follows on the heels of a standing ovation given to Louis Farrakhan by an audience at the same institution. The pivotal role of ultra right-winger Peter Thiel in the Ron Paul fund-raising effort. Thiel has donated most of the money that has gone into the Utah-based Ron Paul super PAC. In FTR #718, we looked at Thiel’s links to the Underground Reich milieu. A German national who has become one of the most important officials in the Mormon faith has overt links to the vertriebene milieu. Jerry Uchtdorf’s family are Sudeten Germans, expelled from Czechoslovakia and later East Germany, experiences that apparently informed much of Uchtdorf’s current political perspective. “Ron Paul Says He Won’t Quit Race” by Carla Marinucci; San Francisco Chronicle; 4/6/2012. “A Friendship Nurtured in 1976 Resonates in 2012” by Michael Barbaro; The New York Times; 4/8/2012. Paul’s version of freedom is encapsulated in Anatole France’s observation that “The law, in its majestic equality, forbids the rich as well as the poor to sleep under bridges, to beg in the streets, and to steal bread”. 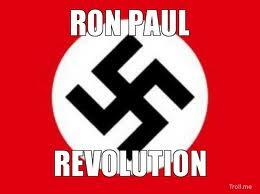 His simplistic libertarianism is an apotheosis of the wealthy and differs from Nazi ideology in no important aspect. What can progressives be thinking? @Dwight: I totally agree with the apotheosis part but I’m afraid the Anatole France quote doesn’t seem to be at all accurate. I’d describe it more like this, if I may: The rich, being the superior class they supposedly are, in the corporatist view, will have free reign to do pretty much whatever they please, while the poor and middle class are stuck in a dog-eat-dog existence where they are not only forced to beg and steal to survive, but perhaps even persecuted when they do manage to move up! Again, Dwight, just to reiterate, I wholeheartedly agree with this sentiment of RP glorifying the wealthy, as all the evidence I’ve seen is that he is indeed a pro-corporatist fringe faux-libertarian that many people have come to view him as. And the real tragic thing is is that he has managed to present himself in a manner that does still endear him to some of the more centrist leaning social progressives, particularly the hijacking of the pro-cannabis movement(which the Establishment completely despises, btw. Same reason they tried to destroy the youth movement in the ’60s). However, though, I also see that more people are beginning to ask questions, most notably, why he seems to be associated with Holocaust deniers & other fringe-right assholes and dickheads(like Mr. Duke for instance), so there is some hope, and frankly, RP’s chance for any major success in denting the Democrats’ voting ranks was in ’08 and he failed miserably. With more and more people getting pissed off at the GOP and liberals starting to come together, if RP is going to be manipulated by the Criminal Establishment as Nader was, it’s likely they’ll fall flat. Dave: Your Aryan Nations show (part four) mentions a Ronald Paul having knowledge of and supporting the failed Dominica coup of 1981. Michael Perdue says that he and the infamous John Connally gave it the thumbs up. Can I assume this is the same fella? @Brad: Hello, Brad! Personally, I now find myself asking the same question. It’s been a long time since I’ve listened to that particular show but I’m gonna go back to it sometime and see if I can put some pieces together. Who knows? Maybe ol’ Ronny was connected to the Dominica incident as well. Yes, it is the same Ron Paul. Note that he is joined at the hip with Romney. May 24, 2012 8:45 P.M.
Sources close to Senator Rand Paul tell National Review Online that Paul and Mitt Romney had a private meeting on Wednesday. Details of the topics discussed are hazy, but Paul – the son of Texas congressman (and presidential candidate) Ron Paul – reportedly found the meeting productive. Why do the Mormons keep a copy of everyones birth certificate?